As an Australian, you might wonder why I would be interested in joining a “Koalas and Kangaroos in the Wild” tour. Surely I see these animals regularly? Don’t they all live where I live, sleeping in the trees in my garden and hopping alongside us as we drive? As much as I would love this to happen, well the sleeping in trees part anyway, these are all myths. Whilst, I have been fortunate enough to see plenty of these wonderful creatures in my time, they are definitely not an everyday occurrence. You see, I live in the city, and these native Australian animals live in the bush. It’s also one thing to see them, and entirely another to be able to learn more about them. To learn more is to understand more, which in turn helps us to protect them. “The Koalas and Kangaroos in the Wild” tour operated by Echidna Walkabout Tours was a perfect way to do both. I got to learn so much about them when I joined guide Scott for a day out in the Western Plains of Victoria, about 45 minutes west of Melbourne. Read more: Road trip to National Parks and wildlife. A 3-week itinerary. As the cityscape gave way to open plains and more trees, I knew it was going to be a great day. A Canadian and British gentleman and two Panamanian women were my travel buddies en route to the You Yangs, home of the koalas and Eastern Grey kangaroos. Watching these visitors to my country walk through Australian bushland, looking for koalas, whilst taking in all of the surrounding beauty made my heart sing. I watched them, as we walked one track after another, eyes skyward, necks stretched as far as they could reach, willing each tree to be the one that would have a fluffy grey bear. Time moved on, and every so often, their head would fall and shoulders slump as the koalas failed to appear. Our guide, Scott, moved us to different locations in search of them. Each time, he explained what we were looking for and why we might find them in a particular location. This, after all, is a wild, nature tour. Koalas moved every day, as a general rule. No animals are kept in captivity so everything is subjected to the forces of nature. It is possible, that you could walk all day and never find one. I found myself looking harder, on behalf of my fellow travellers, hoping to spot the very thing they had come looking for. Eventually, we were rewarded, not once but twice. Firstly, baby KiKi, a sweet little ball of fluff, was spotted, doing what koalas do best….sleeping. Koalas are nocturnal animals, so our timing was right in the middle of their siesta. Watching everyone’s eyes light up in amazement at these sleeping bundles was pretty special. Eventually, she awoke just in time to give us a cheeky smile and wonder what all the fuss was about. All koalas in this area are geo tagged by the guides and researchers when they are spotted. Three photos are taken each time a koala is seen. The first notes the area they have been found in, the second notes the koala and the third photo is taken of the nose, a specific way of identifying an individual koala. All of this information is a valuable source of intelligence to the koala researchers. Later in the morning, we had the pleasure of meeting Pat. Well, a virtual, up a tree type of meeting. Pat, an older koala, was less interested in being on show, keeping her head firmly tucked in and away from our peeping eyes. Throughout the day, the questions that came from the others with regard to the Australian bush and wildlife was interesting. Information that is obvious to me, is an opportunity to learn for others. It’s exactly what I do when I’m in someone else’s country. The desire to learn more and improve their perspective was refreshing. A trip to the Aussie bush just wouldn’t be the same without a billy tea lunch. After spending the morning tramping over the paths, stepping over branches, and watching the many birds that came our way, we stopped for a bite to eat. The wind had started to pick up midway through the day, so the rustle of leaves overhead provided some typical ambient bush noise. The looks on the faces of the others was hilarious as they watched our guide put leaves from a variety of nearby eucalyptus trees into the boiling water. It was a mix between fear and nervousness, but it was playing out in a very visible way. He then proceeded to swing the billy, using one arm, around and around in a circle. This, according to the tales of the bushmen, is how real tea is made. The end result is a hot brew with an evident minty taste. The British man, as you could imagine, took enormous pleasure from it. When combined with an ANZAC biscuit and a piece of lamington cake, he was in heaven. After lunch, we left the You Yangs and made our way to Serendip, a former sheep station which is now an animal sanctuary. With over 20% reforested, it’s also a great place for bird breeding. The Eastern Greys are also the resident kangaroos out here. Walking slowly, and in a group once more, we make our way around the outside of a line of trees. 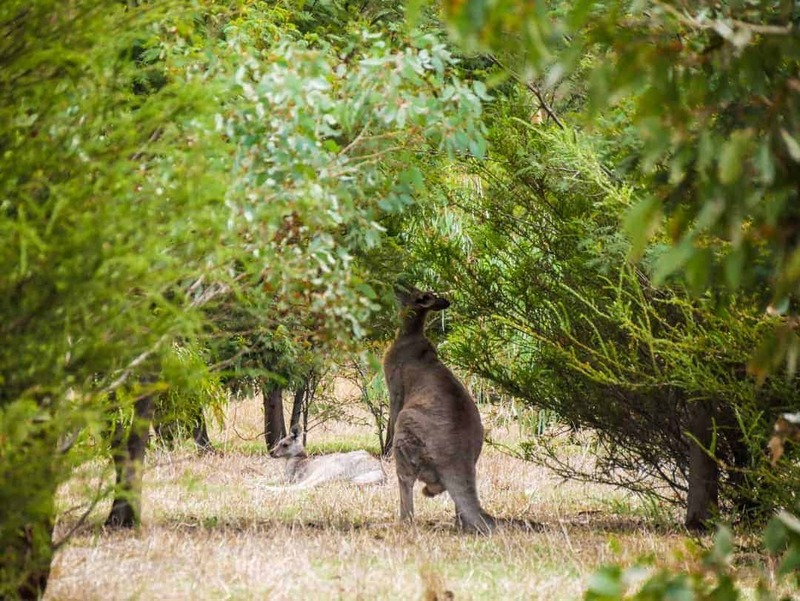 Within the sanctuary of the trees, a group of kangaroos rest in the afternoon sun. Like the koalas, these kangaroos are nocturnal, saving their energy during the day for their night time activities. Look closely – can you see the baby joey in the pouch ? Bird watchers are frequently drawn to this area. Down by the water, evidence of the bird breeding programs can be clearly seen. The birdlife is indeed plentiful here. Echidna Tours is also a strong promoter and enforcer of the environment and its conservation. As evidence of this, 50% off all tour profits are invested directly back into conservation efforts including koala research. To grow the conservation message, those participants on the tour are also encouraged to assist with one of their important programs. The proliferation of boneweed, a plant introduced from South Africa to the Western Plains area has had a direct and profound impact on the koala population. As participants, the issue was explained to us and we were then encouraged to remove the offending plants as we made our way through the bush. Little by little it makes a difference to a point where their research can attribute a 12% increase in the koala population in this area as a result of the removal of this plant. Staff are involved in a tree planting program, where small trees are cultivated at their homes and then eventually planted back out in the bush. 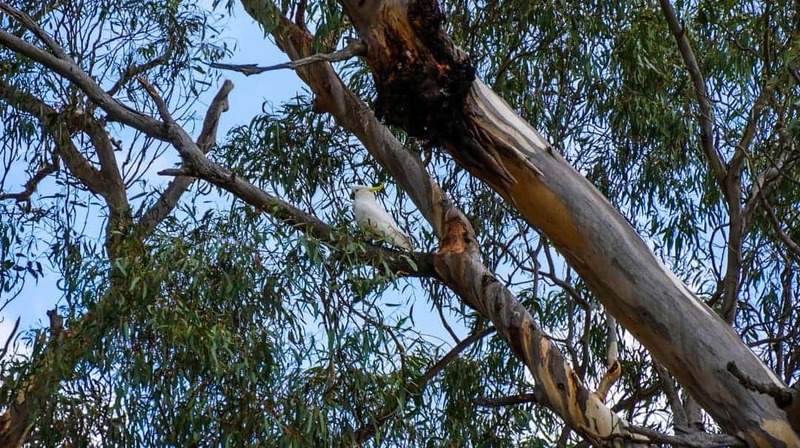 Despite probably not having huge expectations of spending a day out in the bush looking for native Australian animals, I was pleasantly surprised. The tour was a great blend of information about the wildlife we saw and also the company’s associated conservation efforts. It was conducted at a pace that would make it easy for people of all ages and conditions to participate in and it was a lot of fun too. Obviously having the right type of guide plays a big part in this too. If you are a visitor to Australia, or just an Aussie who would love to learn more about these animals, I’d highly recommend this tour. It’s an easy day trip out of Melbourne, and every aspect of the day is taken care of for you. It is run in a highly professional manner and the tour guides are well educated in everything you need to know about the areas that are visited, the animals, the conservation projects and are quite willing just to have a chat as well. The “Koala and Kangaroos in the Wild ” tour operates from Melbourne, Australia. Apart from Christmas Day and Boxing Day (25/26 December), tours operate all year round. Pick ups occur at five different locations in the Melbourne inner city area. Pickup times range from 8.10am – 9am depending on location. Return drop offs are in the same location as the pick up points, somewhere between 4pm-5pm. Melbourne’s weather is subject to frequent change so it’s a good idea to take clothing to suit all four seasons. A good hat, sunscreen, good walking shoes, umbrella, rain jacket and a warm jacket are all a good idea. You don’t need to walk everywhere with this gear. All can be left safely in the mini bus when walking through the bush. I can’t stress the good walking shoes enough. We walked about 8km through bushland that is full of broken branches, holes and other obstacles. Do yourself a favour and leave the heels and city shoes at home. Listen to the guide and remember to be respectful of others, the environment and of course the animals you come across. This is their patch! Take a water bottle. The guide will have water on board but it’s just easier if you take your own bottle. Do let the company know of any dietary requirements when booking so that your needs can be catered for. Don’t forget your camera. You don’t want to miss any opportunities. With regard to your pickup point, make sure you know exactly where they will pick you up from. Some hotels that are in the pick up locations have multiple lobbies on different streets so it can be a bit confusing. I was invited to attend this tour by US website EcoTourLinQ. All opinions and thoughts of this tour are entirely my own. We are planning on visiting Melbourne next year and hope to take this tour. Would not have heard about it without your post. Thanks so much! My absolute pleasure Marvin. Hope you enjoy it as well.